Crystal Jewelry Inspiration from the CREATE YOUR STYLE Ambassadors features projects from 30 of these talented designers from North America. The CREATE YOUR STYLE Ambassadors approach crystals from every conceivable angle in projects as diverse as the SWAROVSKI ELEMENTS they’ve used. Wide-ranging techniques, from modern bead stitching and elegant stringing to intricate wire crochet, help beaders polish their favorite skills plus learn something new. Styles range from vintage to funky to show-stopping glam, all sporting the sparkle that only crystals can provide. Jewelry makers will get first-hand information, expertise, and instruction from the most enthusiastic and passionate crystal jewelry designers working today. The gallery will inspire you with projects from Ambassadors around the world. Below is the project "Audrey's Torsade" by Linda Hartung. The necklace features the Alacarte "Window's Clasp which can be purchased online click here. SOUND – The 2012 edition of CREATE YOUR STYLE with SWAROVSKI ELEMENTS Magazine It’s all about SOUND in this year’s magazine, which probes crystal’s connection with the sonic world as a whole as well as investigates the role crystal plays in the contemporary music scene. In page after page of snazzy snapshots of the amazing world of acoustics and in-depth forays into Swarovski’s musical heritage, the publication provides readers with an insight into all the fascinating facets of Swarovski, including a look at the latest SWAROVSKI ELEMENTS innovations and tip-offs on upcoming special events and an essential guide to the CREATE YOUR STYLE Online World and the CREATE YOUR STYLE Ambassador Program. It also includes a Store Finder, a must-have tool for tracking down the many CREATE YOUR STYLE Recommended Stores throughout the world. And of course, the magazine’s pages also put an ear to today’s top trends to provide a selection of designs made dazzling with SWAROVSKI ELEMENTS, along with step-by-step instructions on how to bring them to life yourself! It’s a cover-to-cover extravaganza for creative crystal-lovers of every skill level and an encyclopedic tool for CREATE YOUR STYLE follower from every segment. Learn to create a variety of surface designs with techniques that turn those fabrics into luscious beads you can use in your jewelry, art quilts, wearables, mixed media projects or home decor. 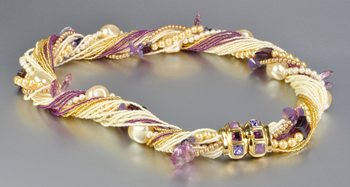 Features a full page of embellishing the beautiful beads you create with WireLace. There is also a gallery which has several ideas including some with more ways to embellish with WireLace. on the first inside page.